“Nothing is more powerful than a woman’s struggle to run free“. “Nike is a Goddess: The History of Women in Sports” tells the stories of women who excelled in sport and broke the mould to push the boundaries of what women were allowed to do. In doing this they set an example for us and for future generations of women and that’s why I believe it is important for their triumphs and achievements to be known about today. I’ve become increasingly interested in the history of women’s long distance running after finding out more about Kathrine Switzer and Joyce Smith. “Nike is a Goddess” traces the development of women’s involvement in sport from the 1880s to 1998 and the personal and political significance of the changes that took place. The book comprises 13 chapters, each written by a female sports writer covering their specialist area of sport. Chapters include skating, skiing, baseball and softball, tennis and golf, but the one I am most interested in is Track and Field. Nike has become so associated with the contemporary sportswear brand that we might easily forget that it is also the name of the ancient Greek goddess who was the personification of the ideal of victory. She was often portrayed carrying a wreath which would be presented to victorious military heroes and athletes, all men of course. Sport liberates women from cultural constraints about how they should look and behave, allowing them to define themselves differently. For example, thinking more about what they want to achieve in their sport rather than how they look, and enjoying the feelings of power and freedom that come from physical exercise. (This is very much the message of the current “This Girl Can” campaign from Sport England). In this context it is easy to understand why women’s participation in competitive sport has been seen as threatening to the male sports establishment and to society. Many arguments have been put forward to prevent women from participating, including that women did not have the strength for endurance sports such as running and that their gynaecological health would suffer – they might even become infertile. Women have been excluded from clubs and events. In athletics women were prohibited from running more than 200m at the Olympics from 1928 to 1960, and had to wait until 1984 for the chance to compete in the Olympic marathon, 88 years after the first all-male marathon at the first modern Olympics in Athens (1896). The chapter on Track and Field, entitled “Somewhere to Run” by Kathleen McElroy, outlines the early development of athletics in Europe and the United States. A notable figure in this history is Frenchwoman Alice Milliat who created opportunities for women to compete internationally in the early 1920s when they were excluded from the Olympics. In the United States women’s colleges played a pioneering role in setting up athletics and other sports for women in the late 19th and early 20th centuries, but this innovation was stymied to some extent by a focus in education on fitness for all rather than competition. It was companies, including department stores, insurance companies and railway companies, that gave many working-class women the opportunity to compete in athletics through their sports leagues and created the first female American athletes to compete internationally. “Babe” Didrikson (1911-1956) was one of these athletes who benefited from company sponsorship. She was an outstanding sportswoman and on leaving high school was given a job at an insurance company so that she could play on their amateur basketball team. Still sponsored by the company she moved into athletics and excelled in many disciplines, setting US and world records. She competed in the 1932 Olympics winning gold in the javelin and 80 metre hurdles and silver in the high jump. Amazingly she then went on to play golf and won every title available. There is a park and museum dedicated to her in Beaumont, Texas. In the face of the prejudice and discrimination that characterised the racially segregated America of the 1930s, black colleges and universities began to develop women’s athletics, free of the objections to competition that limited participation in the white colleges. They did it with such determination and success that by the 1948 Olympics most of the US women’s track and field team were black. 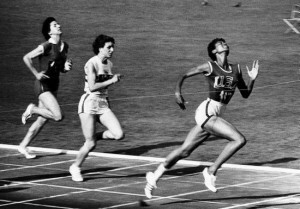 Wilma Rudolph (1940-1994) was born in poverty and faced serious illness in her early childhood, including polio. Her athletics career was helped by the training programmes and support that had been established by the black colleges. She was talent spotted by the women’s athletics coach at Tennessee State University. At 16 and whilst still at high school she competed in the 1956 Olympics, winning bronze as part of the sprint relay team. Despite some personal difficulties Rudolph continued to train hard and improve, gaining a place on the 1960 Olympics team. She won both the 100 metres and the 200 metres and was part of the winning relay team. When she returned home to Clarksville, Tennessee, a banquet was held in her honour and she later wrote that it was the first racially integrated event in the history of the town. “Nike is a Goddess” is a North American book. It looks at the development of sport in the West but its main focus is the stories of American athletes. It has introduced me to some women I might not otherwise have heard of, who are no doubt much better known in the States than in the UK. But it has also left me curious and keen to find out more about British athletes and how women’s endurance running developed in the UK. I’d be very interested to know of any books about the development of women’s athletics in the UK. In this blog I want to celebrate what British women runners have achieved and the huge growth in the numbers of women running but I also don’t want to forget the countries in the world where girls and women are not allowed to compete in sport. The stories in “Nike is a Goddess” of these exceptional women, who often had to fight to compete, remind me that we should never take their achievement for granted, and there are still more exceptional women to come before all women around the world have the rights we enjoy. 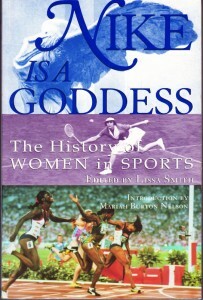 Nike is a Goddess, the History of Women in Sports, edited by Lissa Smith, Atlantic Monthly Press, New York, 1998. Additional information on Didrikson and Rudolph from Wikipedia. The banner photo of an unknown woman crossing a finishing line is from Flickr Commons and was taken at a sports day held by the London School of Economics in the 1920s. I love the look of determination on the woman’s face as she wins the race. We may not run in gymslips and plimsolls but we can all understand that sprint for the finish.